Sri City, November 7, 2016 :- Senior police officials headed by Mr. G. Srinivas, IPS, Superintendent of Police (SP), Chittoor District convened a Vigilance & Security meet, in Sri City on Monday, which was attended by the heads of industrial units and managers of human resources divisions. Mr. Ravindra Sannreddy, Founder Managing Director, Sri City extended a warm welcome to the SP and other police officers. Opening the discussion Mr. Ravindra Sannreddy said, “Any industrial activity will thrive only when there is a safe & secured atmosphere. It is particularly true when the industrial parks have units, besides the domestic, from other countries, in diversified sectors.” Seeking the cooperation and participation of all the stakeholders, he said, “Together, let’s all aim to make Sri City a model City, even in ‘safety & security’.” He thanked the SP for arranging the conclave. Addressing the participants, Mr. Srinivas briefed on the very intent of holding the meeting and said that the aim of his visit was to discuss on the security issues and explain the stipulated procedure in vogue on the various safety and security related subjects, including the movement of visitors and foreigners in Sri City. 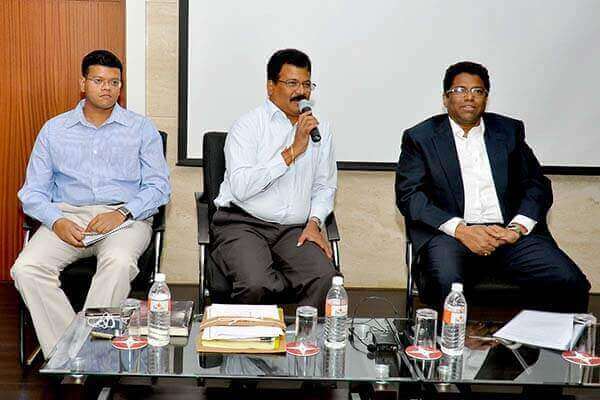 Highlighting the need for vigilance, Mr. Srinivas appealed all the stakeholders to be vigilant, and stated, “Unless we are vigilant, we cannot be safe and secured.” He requested the industrial units to share the data pertaining to the visitors and expats on a regular basis to the police. He announced that shortly a state-of-the-art police station will be functioning in Sri City with Central Command Control and a mobile command post. He recommended to develop a consolidated approach and action plan for strengthening the existing safety and security systems for resisting the challenges and any security threats. He explained the hierarchy of police in the Sri City region and gave the contact details of the officers who can be contact on any emergency. Mr. Abhishek Mohanti, IPS, Additional Superintendent of Police, Mr. Ramkumar, Dy. Superintendent of Police, Mr. G. Nagabhushan Rao, Dy. Superintendent of Police, Puttur, Mr. Shaikh Altaf, General Manager, Security & Vigilance, Sri City, and about 100 senior executives of Units and their HR managers attended the meeting. At the end there was an interaction session in which all the delegates actively participated and got clarified their doubts.